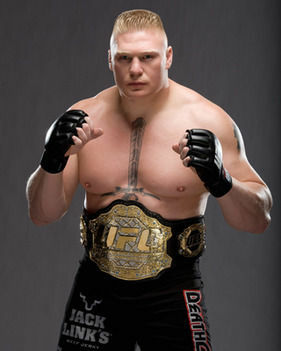 WWE Universal Champion and Former UFC Heavyweight Champion Brock Lesnar Set To Return To UFC After Wrestlemania 34? 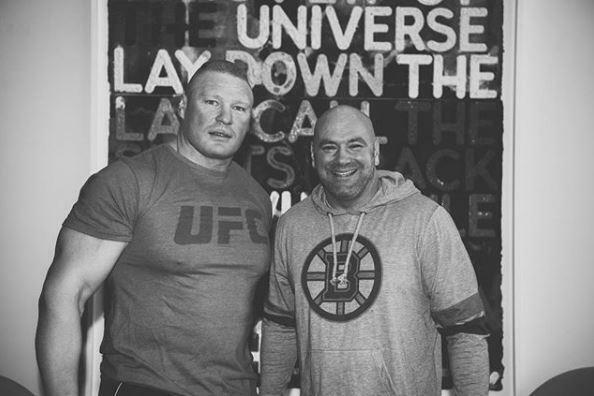 UFC President has indicated that there is a very, very, very good chance that Brock Lesnar enters into the UFC Octagon once again. The above picture was taken over the weekend and led to many tongues wagging. The Beast will soon be out of contract with the wrestling company with his last rumoured to be at WrestleMania against Roman Reigns on April 8. But White has fuelled speculation on his future by sharing a picture of him and Lesnar, kitted out in UFC attire, over the weekend. And the promoter suggesting that he could be returning to the cage as he accompanied the snap with a grinning emoji face. Lesnar last fought at UFC 200 when he defeated Mark Hunt in 2016. But that victory was marred by two failed drugs tests and a subsequent one-year ban. Despite that, he remains a huge box office draw and guarantees massive pay-per-view buys. The organisation is desperate for more superstars and would likely welcome Lesnar back with open arms. More over at the Sun. Lesnar’s one year ban from MMA ended in July 2017.